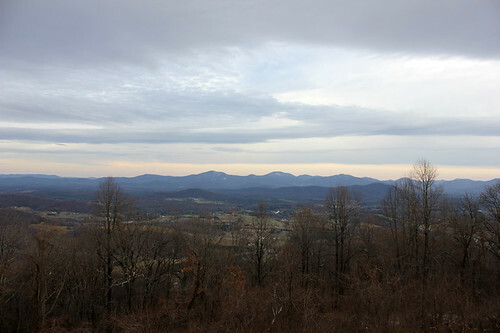 I spent the holiday weekend down in Virginia visiting my parents. On the day after Thanksgiving, we took a drive through the mountains and stopped at the Blue Mountain Brewery for dinner (and drinks, obviously). Either we were still full from Thanksgiving dinner, or the portions there were really large – but we ended up with more food than we could eat! Note the flight of beers in the background! 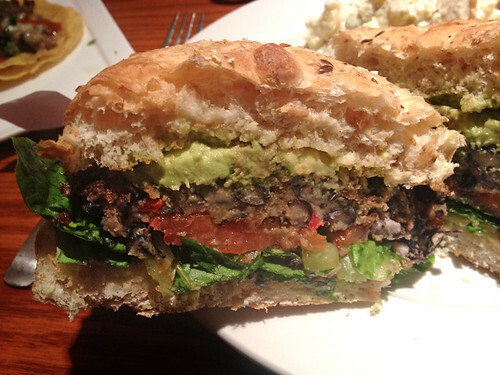 I was very happy to see that the patty was a house-made black bean patty. Unfortunately, it was quite heavy on the beans, so even though I could see some bits of peppers and onions in it, it felt like I was just eating a bunch of beans mashed together and fried a bit on the outside. Note: the patty contains cheese, so it is not suitable for vegans! The avocado, lettuce, and tomato were nice and fresh (I love avocado on a burger – especially when you don’t have to pay extra for it!) and the chipotle sauce was a slight kick of spice but it seemed like they were keeping it pretty mild to appeal to customers who might not like spicy things (same for the patty, which had some seasoning but I would have liked to taste more!). I requested my burger without cheese, but it does come with cheese if you order straight off the menu. And the organic 7-grain bun was soft and fresh as well (from a local bakery), nice and tasty, and a good size to accommodate the patty and toppings. They do have gluten free buns available upon request, which was a nice touch to see. 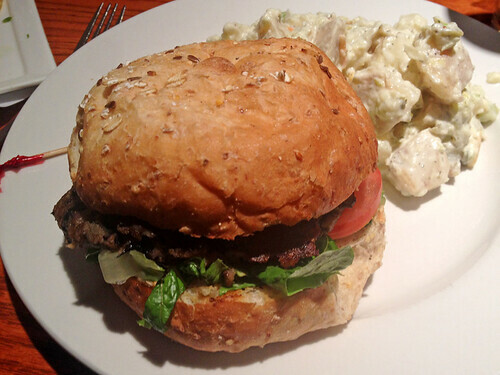 The burger came with a choice of side – I got the potato salad, as if I hadn’t eaten enough potatoes at Thanksgiving the night before… ha! 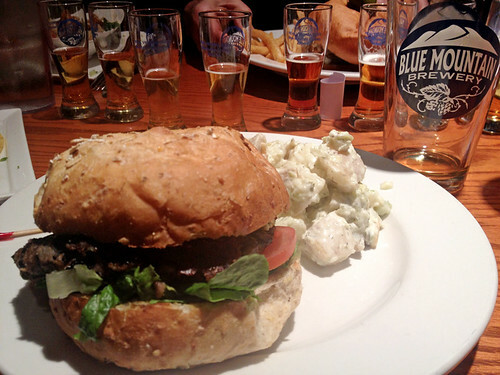 I realize I can’t expect a 5-star burger from a place that is focusing its energy on beer, of course. And while I’d rank this one as “average” it was still far better than a generic frozen veggie patty, and it was the perfect food to fill my stomach while I drank a couple pints of cider (I’m not a beer drinker – so I left the flights to my parents and my boyfriend, but Blue Mountain Brewery serves Bold Rock cider which is an awesome local Virginia cider that I wish I could buy in NY!). And you’ll have to trust my word that the view from the brewery itself is just as gorgeous. Go at sunset, get a seat by a window (or outside, in warmer weather! ).